mineral pigments: Japanese pigments are ground into 16 variations from coarse to fine. The higher the number the finer the grind. #11 is more like what is used in the West for oil and watercolor painting. We worked with #9 and #11 in class. natural mineral pigments: ground minerals mined from various places around the world. They are usually more expensive than synthetic pigments. synthetic mineral pigments: are created through chemical manufacturing rather than by grinding natural minerals. Their size is much more uniform than natural pigments and usually cost less than natural pigments. Although earth pigments don't have the same "refracting" quality of the mineral pigments, they are also used in Nihonga. They are typically fine powder and mix well with the glue. 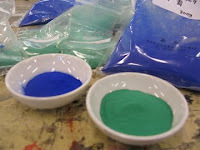 They are especially useful on the first layers of the painting where you want to use the finer ground pigments. Mica powder can be added to pigment or gofun for additional glisten and effects. Did Mako say where the best place to get supplies for nihonga might be (best place online, I suppose I should qualify, since I'm in the midwest where really good art supply stores are scant)?